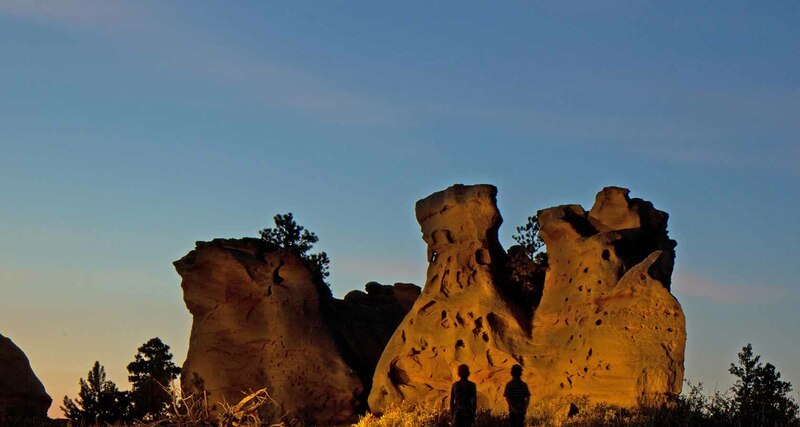 As its name implies, Medicine Rocks was a place of 'big medicine' where Indian hunting parties conjured up magical spirits. 'As fantastically beautiful a place as I have ever seen,' said one of its first tourists in the late 1800s, a young rancher named Teddy Roosevelt. Weathering has given the soft sandstone rock formations a Swiss cheese look. The park is also a haven for mule deer, antelope, Woodhouse's toad and sharp tailed grouse. You can camp, bike ride, go picnicking, watch for wildlife or go hiking on a short .75 mile trail. This unique park is 330 acres in size and is at an elevation of 1,050 feet. There are approximately 12 camping sites with vault toilets, a group use area, grills/fire rings, water pumps, picnic tables, and drinking water. Campers may stay 14 days during a 30 day period. Two golf courses and a museum are located nearby in Baker and there is also a museum in Ekalaka. Due to its primitive park designation, it is a pack-in/pack-out site and there are no fees to enter or stay there. Donations are accepted to assist with maintenance of the site. Medicine Rocks State Park is located 25 miles south of Baker on Montana Highway 7, 14 miles north of Ekalaka.Medicine Rocks State Park is located 25 miles south of Baker on Montana Highway 7, 14 miles north of Ekalaka.